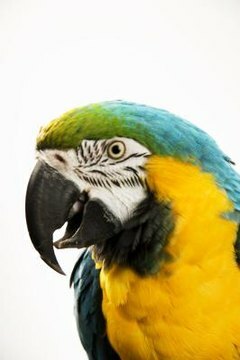 Parrots and their relatives are some of the most familiar birds due to their beauty and common inclusion in the pet trade. All birds in the order Psittaciformes commonly are called parrots, whether they belong to the true parrot family (Psittacidae) or the cockatoo family (Cacatuinae). All Psittaciformes birds are related closely and share common characteristics. Parrots belong to the family Psittacidae in the order Psittaciformes. Psittacidae contains the following subfamilies: Loriinae (lories and lorikeets), which has 12 genera; Psittacinae (parrots, parakeets, macaws and relatives), which has over 60 genera; and, with one genus each, Loriculinae (hanging parrots), Micropsittinae (pygmy parrots), Psittrichadinae (Pesquet's parrot), and Strigopinae (kakapo). There has been some confusion on separating Psittaciformes into families, with many authorities on the subject separating Psittaciformes into two families: Psittacidae and Cacatuinae. Some also separate Nestorinae into as its own family. Cacatuinae, which has six genera, and Nestorinae, which has one genus, sometimes are considered to be subfamilies of Psittacidae. Some 350 species of parrots and parrot relatives are found within the genera of these families and subfamilies. Most parrots share a few common characteristics, including a strong, hooked beak, bright colors and zygodactylous toe arrangement, meaning they have two toes pointing forward and two pointing backward. Most parrots live in tropical climates around the world, including Australia, South America and Africa. In addition, most species are social birds, at least to an extent. It is not uncommon to see large flocks of budgies, cockatiels or lorikeets in their native lands. Their sociability is a great factor in their suitability for the pet trade: pet parrots tend to bond closely with their human counterparts, sometimes as close as they would with a mate. The largest parrot is the Hyacinth macaw (Anodorhynchus hyacinthinus), which reaches lengths close to 40 inches and weights of approximately 3 1/2 pounds. This species is more than 10 times longer than the smallest parrot, the buff-faced pygmy parrot of New Guinea, which reaches only 3 1/2 inches long, making it smaller than the common pet species, the budgie. Other notably small parrots include lovebirds, fig parrots and Asian hanging parrots. Other large parrots include the colorful green and scarlet macaws. Nearly every species of bird in the pet trade is a parrot. Finches, canaries, doves and quail are among the few that don't belong to the order Psittaciformes. Lovebirds, parakeets, budgies, African greys, cockatoos, conures, cockatiels, macaws and lorikeets often are kept as pets, each having their own traits and quirks that make them favorites. Why Does a Parakeet Twitch? Can Cockatiels Get Along With Zebra Finches? What Is the Origin of Cockatoo? Where Do Parakeets Come From?